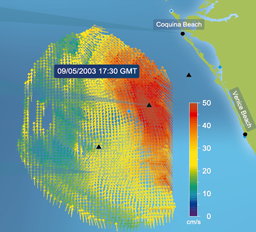 The WERA system (WavE RAdar) is a shore based remote sensing system using the over the horizon radar technology to monitor ocean surface currents, waves and wind direction (Gurgel, 1999). This long range, high resolution monitoring system operates with radio frequencies between 4 and 50 MHz. A vertical polarized electromagnetic wave is coupled to the conductive ocean surface and follows the curvature of the earth. Coastal Radar "WERA", a tool for Harbour Management (pdf 761 KB) Thomas Helzel, Vincent Mariette, Marc Pavec, 2010.